Onychomadesis is the spontaneous, complete shedding of the nail from its proximal side, without pain or inflammation, following nail matrix arrest. 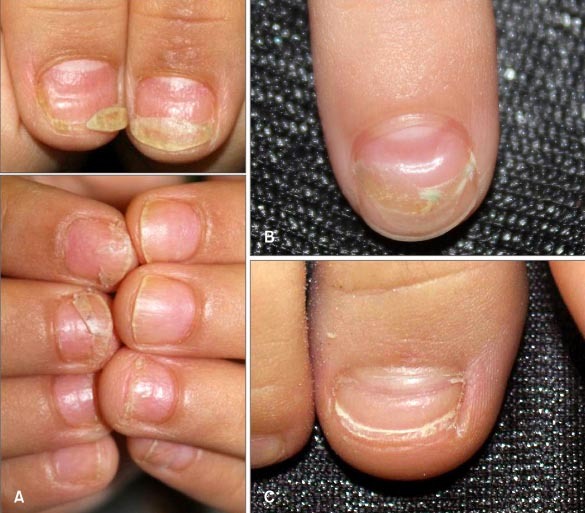 Brian Maurer, a pediatric practitioner, recently saw a 5-year-old boy with a two-week history of nail shedding. The child had antecedent Hand, Foot and Mouth disease. 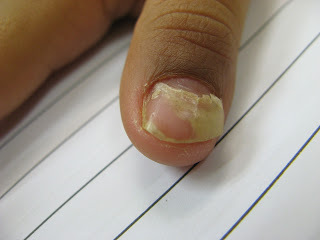 Nail shedding has been described as a sequela to HFM Disease. From: Onychomadesis: A common sequalae and concern for patients after Hand Foot and Mouth Disease: Pediatric Infectious Disease Blog. This entry was posted in Brian T. Maurer and tagged Foot and Mouth Disease, Hand, Nail dystrophy, onychomadesis by humanemedicine. Bookmark the permalink.